As one of my friends has stated: “It’s just too hard to watch the Brewers these days.” Yes, it has been hard to watch the Brewers as they have fallen out of first place in the National League Central. Just think, it’s possible that the Brewers will have been in first place in their division for almost five months of the season yet they might not make the playoffs. At the end of the day on August 20 the Brewers were 71-56 and held a 1.5 game lead over the Cardinals. Since then, the Brewers have gone 3-13, the worst record in the majors since that day. Since August 26 the Brewers have gone 1-10, again the worst record in baseball. In September, Milwaukee is 1-6, tied with the Texas Rangers for the worst record in the majors. 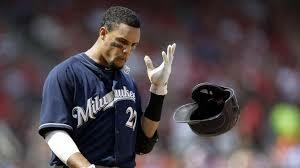 Anyway you look at it, this has not been a good couple of week for the Brew Crew. One of the interesting things about this collapse is that if you look at the Brewers September record under Ron Roenicke prior to the start of this season, the Brewers have played very well in the last month. During Roenicke’s first three years the Brewers were 50-33 after August 31, a .602 winning percentage. In fact, if you go back five seasons, the Brewers have played .500 or better in each of those five last months of the season, compiling an 81-64 record. There was reason for hope that the Brewers would play well in the last month of 2014. Of course, there are still 19 games remaining in the season and the Brewers can turn things around. In the first full 45 seasons of the Brewers franchise (including the 1969 campaign as the Seattle Pilots), the last month of the season has not been very successful. From 1969-1997, the Brewers played in the American League. In those 29 seasons, the Brewers played .500 or better after August 31 in only 13 of those seasons. In the 16 seasons in the National League, the Brewers have played above .500 in seven of those last months of the year, and twice played exactly .500. Here’s a look at the five best and five worst last months of the season the Brewers franchise has had since 1969. Note: To make sure that they do not have one of the five worst last months in franchise history, the Brewers will have to go 8-11 in their last 19 games. Winning less than 8 of their last 19 games will put this year’s Brewers team on the above list for worst last month finishes.